Having just blogged about Nescafe's instant coffee with added microground coffee I found Kenco's offering on the same take. The box of ten sachets retails for £1.99, and each sachet weighs 2.5g. There's nothing on the packaging about how much water I needed to use, so I made up a mugful. And as expected the coffee had the all important creama on top. And the taste? I think I prefer it to the Nescafe one. With three different offerings now in the market place it looks like I'm going to have to hold a head to head blind tasting. Watch this space! 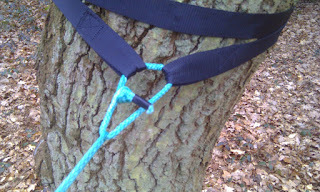 Hugger, soft shackle and paracord sling in use. The thing I've discovered about hammock camping is that it's ideal for those that love to tinker. And for those that like to MYOG. As I discovered finding trees of a suitable thickness and distance apart is an art itself. This is where tweaking the suspension system is a valuable thing to do. Using whoopie slings gives a greater range to where you can set up your hammock because they are highly adjustable. Swapping out karabiners for soft shackles saves weight, each shackle weighs a miserly 3.5g compared to 75g for your average locking krab and does the same job. Both the shackles and whoopie slings use the same principle, made from Amsteel a coreless cord, a loop is made by inserting one end of the cord into itself. Thus when loaded locks on to itself - genius! Unloaded and the sling can be slacked off or tightened up as required. Tree huggers, 1" tape slings with stitched loops, spread the load across the trees bark preventing damage, along with two paracord slings complete the system. I got my set up from DD Hammocks, as I did my hammock. What's not to like? Well the longer the whoopie sling the more stretch in the system, so if you've had to pitch the hammock between two trees that are a way apart you could find yourself closer to the ground than you may like, even if you place the tree huggers at chest height. Despite the silly weight of the shackles the combined weight of the system versus the tapes that were supplied with the hammock only saves a paltry 14g. Using paracord slings rather than tape means the ends of the hammock are bunched tighter making the ends narrower, giving a more constricted feel around my head. 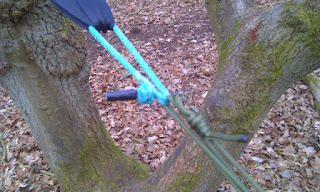 Hugger, shackle and whoopie sling in use. It's difficult to pass judgement after only spending one night in a hammock so I intend to put in some more time in on a trip rather than in the controlled conditions of the backyard. But I did discover that getting into a sleeping bag with a short zip in a hammock isn't easy, so side opening one is a better option, or a quilt. Neither of which I own nor wish to purchase. I sleep on my side so I didn't feel quite as comfortable on my back. That said, I fell asleep watching the clouds scud across a star sprinkled sky, and awoke to early spring bird song. Bratwurst, like frankfurters, are precooked so only require heating through either by simmering in hot water or frying. 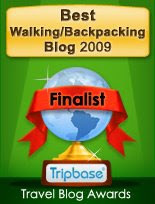 And are similarly vacuum packed making them an ideal backpack provision, keeping for several days unopened. The net weight is 540g so plenty for two, although I managed to greedily devour a whole pack to myself. 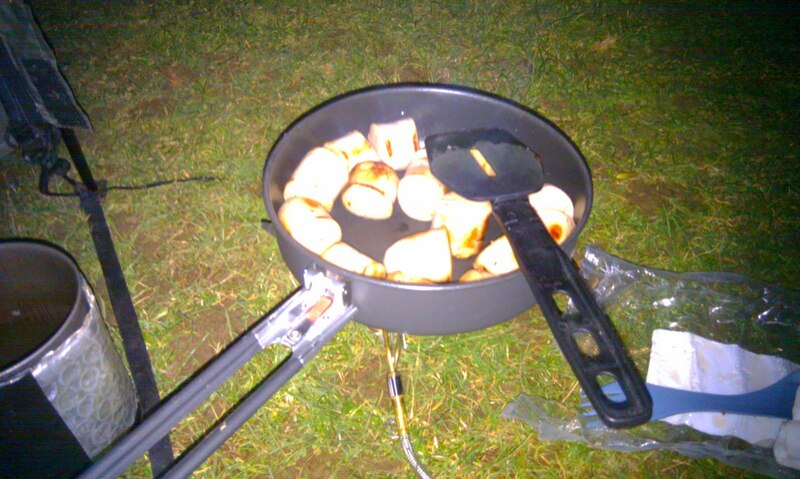 I prefer to fry them because it adds a bit of colour as they are something of a sickly white colour. But don't let that put you off as they have a distinct flavour that marries well with pickled cabbage for example. On a recent trip I sliced them and cooked them in my skillet, serving them up with instant mash. Other ideas could involve making a pasta sauce or some sort of stew. I love cooking. At home the two most used pots/pans are a large Le Creuset casserole and a frying pan or skillet as they are otherwise known. Apart from the more obvious job of frying things I use mine to make risottos, pilavs, chasseur sauces, pasta sauces, in fact anything that requires a large surface area allow the food to reduce down and concentrate the flavours. Out on the trail I'm lazy, I fall back on the same two meals; cheesy polenta, and tuna and mash. Because they're simple, easy to prepare, tasty and filling. And in the depths of winter I don't want to be waiting around to eat. Come the summer though, the days are longer and there's more time for messing around with fresh ingredients. Cooking uses more fuel so there's a weight penalty but this can be offset. Most campsites stock basic provisions, and there's a chance that you'll pass through a village where things can be bought and then carried for the last mile or so to the campsite. And vegetables don't need boiling to oblivion; red pepper, courgette, and mushroom are edible with the minimum amount of cooking. The MSR comes with a folding detachable handle which means if you take any of the other pots or pans in the range only one handle is needed. It has a hard non stick finish which is essential for any frying pan/skillet, the capacity is 1.4l making it big enough to cook a meal for two. It's 5cm deep, has a diameter of 19cm and weighs 160g. The one thing it lacks is a lid but I'm sure I can fashion one out of an aluminium pie dish. With the handle out there will be stability issues with stoves with small pot supports, although it's wise to hold any pot or pan by the handle when cooking especially whilst stirring the food. This is Nescafe's take on Starbuck's Via. Currently on offer for £1.00 at my local Sainsbury's. A box contains five sachets of instant coffee with added micro ground coffee, just like Via. Each sachet weighs 2.5g and the instruction state to use 200ml of water, so for a decent sized mug you might need two. And the taste... as you'd expect the micro ground coffee adds taste particularly as you get the all important crema on top but it isn't as good as the Colombian Via because I prefer bolder flavoured coffee. But at the current promotional price it's hard not to like.